\Programmes\CFSP - Chapter 31\Conference: Europe Post Elections and Prospects for a Multi-speed Europe in Area of Security and Defence – What are the Next Steps? ” European Union can no longer depend on NATO in terms of defence and security and this will most likely speed up the process of creating European defence”. 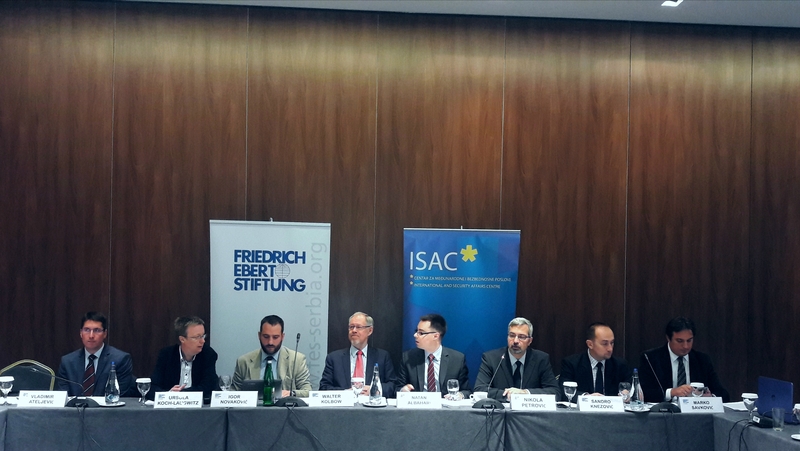 This was one of the main messages presented by the speakers during the conference” Europe post – elections and prospects for a multi-speed Europe in area of security and defence – What are the next steps” organized by ISAC fund and Friedrich Ebert Stiftung. The conference took place on 3, November 2017 in Belgrade and it gathered experts and researchers interested in EU security and defence. Below you can read a brief summary of the presentations. Director of Friedrich Ebert Stiftung regional office for Serbia and Montenegro Mrs. Ursula Koch-Laugwitz said that Europe has faced various different challenges in a short period of time and they have affected both internal and foreign policy of the EU as well as the policies of its member states. Director of ISAC fund, Mr. Nikola Petrović referred to the conference title and emphasized that better understanding of this topic, as well as good communication with the public and political elite, has always been a priority in terms of security policy, especially because of its importance for Serbia’s accession negotiations towards the EU. Research Director of ISAC fund, Mr. Igor Novaković said that all of these crises can be seen as a catalysator for deeper integration of the EU and that they could easilly speed up the process of creating the defence union. However, Mr. Novaković emphasized that deeper integration in security and defence doesn’t mean that we will witness creation of a European army. Senior Research Associate from Institute for Development and International Relations in Zagreb, Mr. Sandro Knezović talked about relations between EU and NATO and also European strategic autonomy. He argued that EU-NATO partnership is facing many bilateral problems, especially regarding relations between the EU and Turkey, as well as common problems on global security. Mr. Knezović underlined that European security used to be guaranteed by NATO and American funds, but that situation has changed. “It became clear that there is a necessity for common security capacities and in the last two years Europe has been moving towards that direction “. Advisor to the Minister of European Integration of the Republic of Serbia, Mr. Vladimir Ateljević stated that the term “Multi -speed Europe“ became quite controversial and that it implicates approach based on differenced integration. What Europe needs today is a deeper integration in field of security and defence. As for the position of Serbia regarding this matter, Mr. Ateljević explained that number of missions in which Serbia participates has grown in the past few years and that today, Serbia is 8th country in Europe in terms of mission contributions. He also referred to Serbia’s cooperation with European Defence Agency and added that this will be of great significance for Serbia in the upcoming years. Finally, program director of Belgrade Fund for Political Excellence, Mr. Marko Savković, offered a short overview of the presentations and agreed with Mr. Ateljević that participation of Serbia’s soldiers in UN and EU peace operations is of great importance for Serbia.